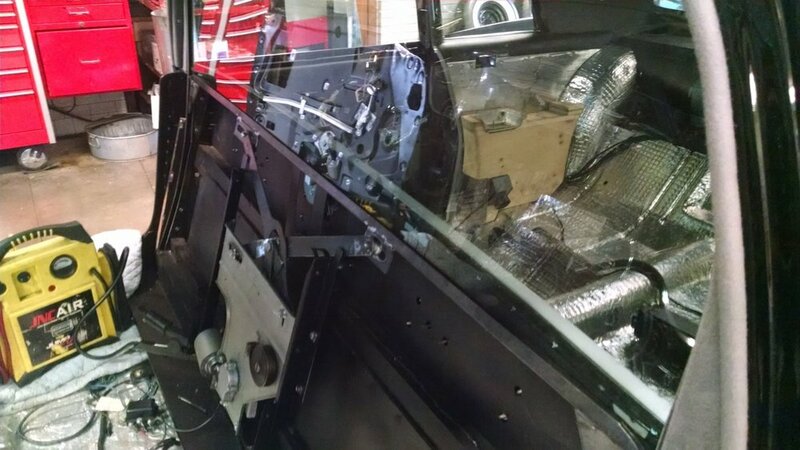 This shot of the Ghia built seat frame also shows the divider window mechanism and glass. The glass, the hoop over the top of the glass, and everything else in this picture other than the electric motor and regulator (both ‘55-’56 limo units) were built by the Ghia factory. The glass beautifully but unnecessarily is curved like a windshield. The divider’s closure panels are now installed and cover the regulator and glass. The front seat will also mount here. This is the divider hoop backside. The hoop goes over the divider glass, the wood is European walnut and all of the moldings, handles, and clock bezel are handmade Ghia. 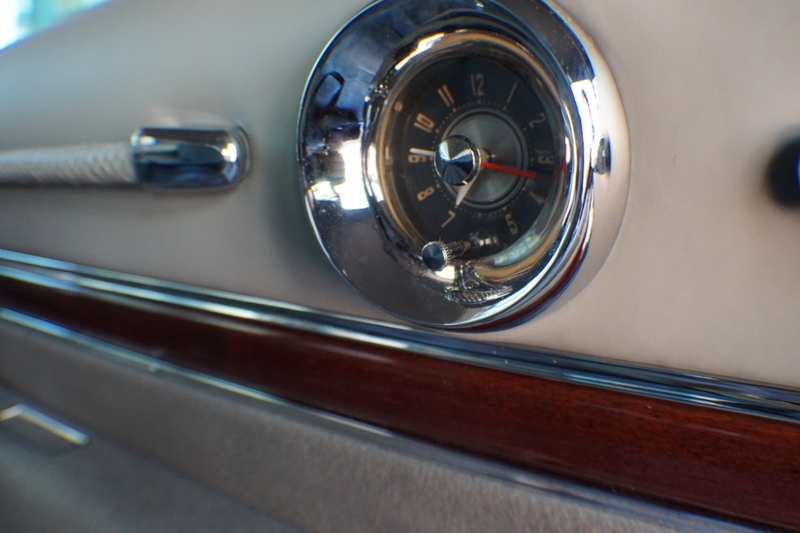 The rear clock is a 1957 dash unit that has had the mounting ears sheared off of it and a custom clamp style mount affixed to it that then screws to the divider panel. The very Italian woven leather straps were reinforced by steel making them usable and beautiful. The two-piece caps on the end of the straps appear to be Ghia only and are also handmade. This shot of the finished divider and front seat mount demonstrates all of the craftsman’s different arts coming together. The handmade chrome plated brass cups in top of the jumps seats are there to serve as handles to open the jump seats. The original spring loaded fillers that cover up the cup were leather covered from the factory and we preferred the cloth. This is the 1955 jump seat, which was the exact same as the 1958 except for the mounting brackets that accommodated the transmission tunnel in the ‘58. Also the jump seat base cushion was modified with transmission tunnel cutouts and handmade cups to pull the seat open from it’s folded position, rather than the straps on the ’55 - ’56. This is a 1958 jump seat. Note the notch for the transmission tunnel. Proof positive that the jump seats were stock Chrysler units. This is the foam seat cushion with part number and the notch cut out of it. 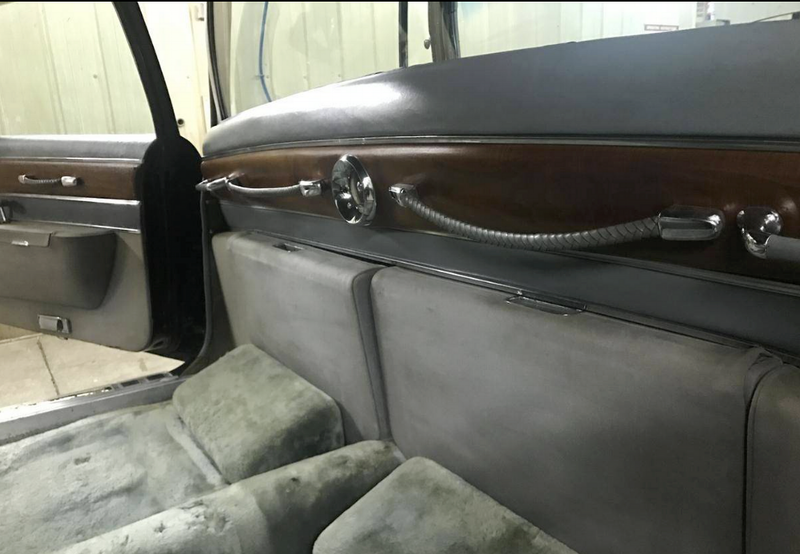 Image of original Ghia footrests in 1957 Ghia Limousine. 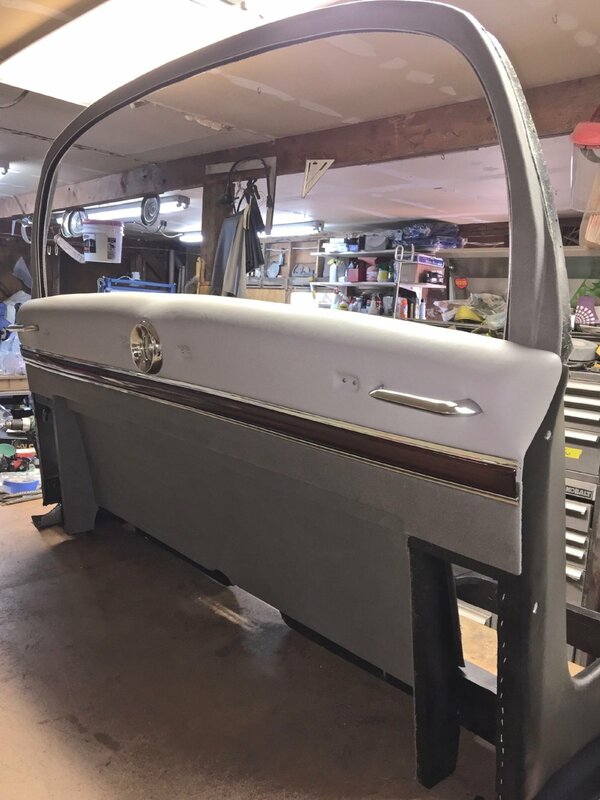 Currently, the 1958 Ghia’s footrests are being restored. Footrests came in ’55-’56 Chrysler limos. They were covered in floor carpeting, not Mouton. Also, the angle of the footrest was increased to accommodate the lower seating position in the Ghias. The Ghias were stretched to make them a true limousine. The current practice of simply whacking the car in half and adding a section in front of the rear seat was not good enough. This depicts the interior part of the rear quarter panel where the seat and the custom quarter rear window would reside. When you open the door on a true limousine the seat does not protrude halfway into the door opening. You have to climb inside and make a turn to sit down. The stretch on the Ghias were accomplished through the floor, the quarter panel, the roof, and rear door, all in different places. So the overall effect was classy and giving the impression of a longer Imperial rather than the overstretched ostentatious appearance of your “normal” stretched limo. Everything you see in this photograph is hand made or hand formed. Also of special note is the furniture like wooden tack strip at the forward edge of the door opening, these were throughout the car and Ghia only items. This is the original fiberboard pattern of the rear door inner trim panel. Note the number “62”. This numbering system was used for many parts of the automobile. Being hand built pieces they were mocked up before final installation and finished/upholstered/chrome plated and then installed on the painted vehicle. 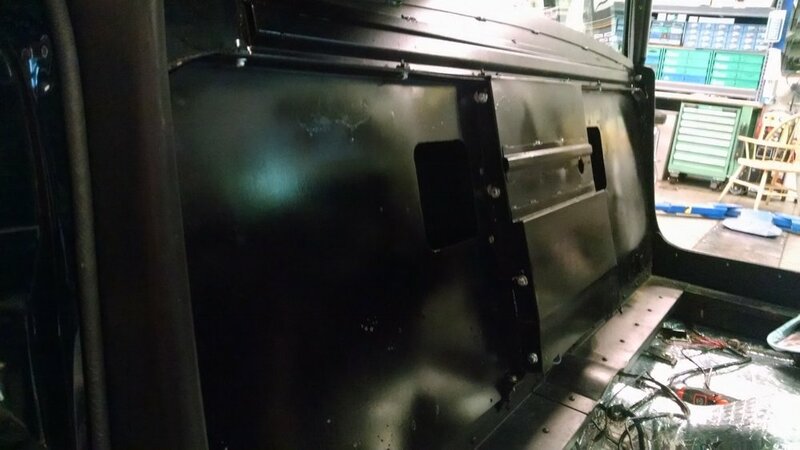 Parts that were marked with paint like this included the interior trim panels, kick panels, door trim extensions, bumpers, and headlight assemblies. Another method of marking was stamping the production number into metal pieces such as door strikers, Ghia specific trim, interior door mechanisms, and virtually anything else that was Ghia produced or modified and made of metal. In 1957 there were 36 cars built. In 1958 there were 32 cars built. However, the number 62 would denote almost the last of the 1958’s built, yet has the VIN number of 004, one of the first ’58s built. It is conceivable that the cars were built as a group and serial numbered later either in Italy or in America. In fact all ’57, ’58 and ’59 Ghia limousines were built by the factory -as 1957s and modified too look like the current year model offered.